Friday 12 May. It is a week since the first chick hatched and a lot of eating and growing has gone on since then. The parents have been as busy as ever bringing food and the chicks are ready to gobble up anything they are offered. The female was awake by 5.10am. At 5.21am there was a muted call from outside. She quickly got herself up and left the box. Immediately the male entered with the first meal of the day. Between then and 9am the pair returned with food 125 times, and by the end of the day the female had brought 159 food items to the box and the male 230. To balance things out, the female frequently spent time doing nest maintainance. 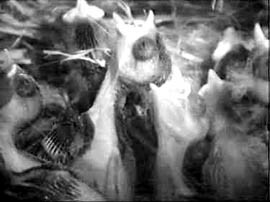 This inevitably involves her 'burrowing down into the cup, tail straight up with the heads of the chicks popping up around her. The female was back in the nest for the night at 7.50 tonight and then spent most of the nest 15 minutes busily working on the edges of the nest cup. 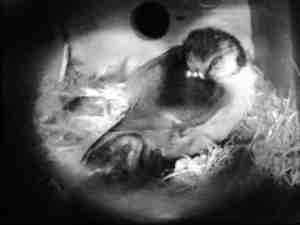 At 11.10 pm she is asleep, perched on a narrow strip of nest with her feathers all fluffed up and her head down and against the south side of the box. She stayed like that for at least 15 minutes. This picture shows one of the chicks sporting a fuzzy punk look. This downy growth on the head has actually been there right from the hatching. There is a dark band appearing down the length of the chick's back and I have seen a similar darkening of the wing front edges. I hope to capture an image to show this later. Saturday 13 May, a day that was dry with mainly hazy sunshine (max 27C). 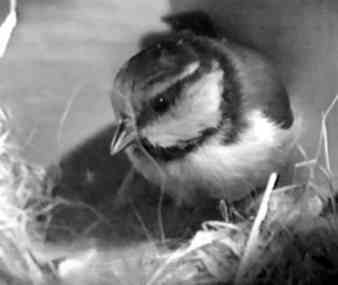 The female spends quite a lot of the night at the side of the nest now and in the course of last night she seems to have enlarged the nest cup, although the left side is hidden under a 'canopy' of straw and feathers. This morning she left the box at 5.12am with a chick's droppings. The male was not heard to call outside the box for another 5 minutes. He entered with the first feed of the day shortly afterwards and by 9am the female had made 53 deliveries and the male 83! My mealworm feeder could only have accounted for a small number of those. Over the last couple of days we have seen a parent bring into the box a large round object. It is difficult to be sure, but it could well have been a whole peanut. 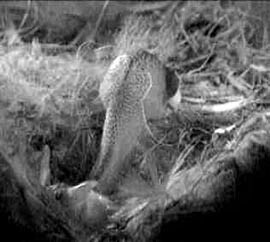 The parent offered it around the chicks but there was no mouth quite big enough, so each time this happened the parent eventually took it back out of the nest. It is easy to see how peanuts could be a problem under these circumstances so please ensure that any peanut feeders that you use do not allow the removal of whole nuts at this time of year. Left picture - mum looking at her offspring and the heap on the left is the 'canopy'. Sunday 14 May, a hot, humid day ( max 29C). The canopy that lay over part of the nest cup has now been removed. Today was notable for a couple of observations that were made about the chicks. For the first time we were able to see eyes opening a small amount at feeding sessions. The development of feathers is quite obvious, especially on the wings. 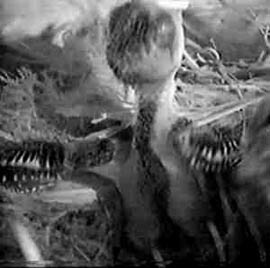 The chicks are starting to use their wings during the clamber for food, and at other times we have seen the chicks stretching and preening them. Large areas of the chicks' backs are still bare except for a dark 'mane' that runs from the head to a lump at the bottom of the back. I guess that this is where the tail feathers will develop from. 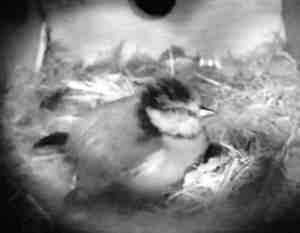 At 9.15pm mum was still working away at the bottom of the nest even though she had now been in the box since 8.10pm. Those chicks that were not being squashed by her try to climb out of her way. Having had two minutes rest in the corner she resumed the nest maintainance again. Monday 15 May, A warm, sunny morning (22C at 11am, max in afternoon was 29C). Last night I recorded through the night to get some idea how much sleep the female would get. The answer seems to be not much. The short periods that she spent sitting on the chicks ( left pic) she was continuously disturbed by their constant movement and she would often she end up tail up (centre pic) after a rest of no more than a couple of minutes. The longest periods of rest that I saw her having were when she perched herself at the side of the box (right pic) and on a couple of occasions she stayed in this position for nearly 10 minutes. She always does this on the south side of the box. and a couple of times she slipped backwards into the cup while still sleeping. These images were captured between 2-3am. There was a healthy(?) population of white 'dots' that rushed around over the glass all night. I wonder if these co-inhabitants of the box are a source of irritation to the resting bird(s). 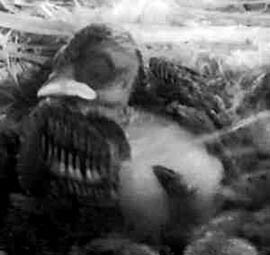 At around mid-day some the chicks started to spread themselves around the box - they are no longer confined to the nest cup! It is, however, a case of crawling on 'all fours' . By the middle of the afternoon all but one had returned to the cup. The one that has stayed in the front corner of the box was ignored by the parents for a couple hours until it was fed twice in quick succession at 6pm. It rejoined the rest by 7pm. 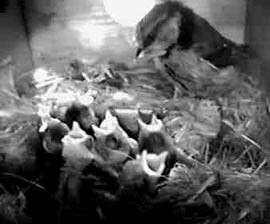 Feeding continued until 8.35 when the female returned for the night. Tuesday 16 May, - Another sunny , but rather windy day(max 20C). Dad provides an evening meal. Only six of the eight chicks try for this one. 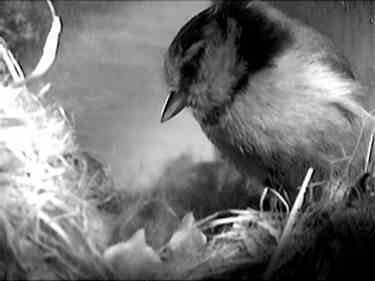 The chicks' development moves on. They open their eyes more now (left picture below), and I have noticed that they are now more likely to turn in the right direction when a parent when food is being offered . In the picture you may just make out the white down on the chick's neck. Much of the body still appears to be bald (right picture). 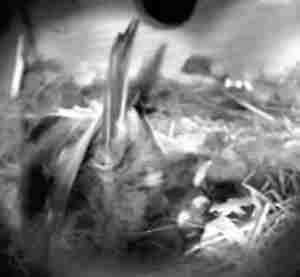 However their wings and the tops of their heads are almost completely covered with developing feathers. 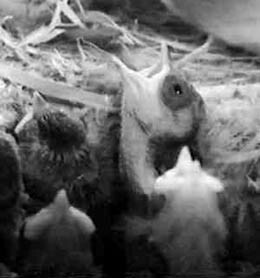 Although they still possess the wide gape of the young chick their beaks are becoming much more pronounced and there is a chorus of muted cheeping with the occasional louder cheep when a parent enters the box. Next Page - The race to first flight.